Did you know I do embroidery too? I love free form embroidery a lot. And what I usually call mixed media embroidery, where there are some elements of painting involved as well as stitching on fabric. I’m in an embroidery group too, so even when I’m not stitching daily I get an infusion of stitching inspiration each month, and usually that spurs my own works on. We also do other fun stuff like exhibitions together! 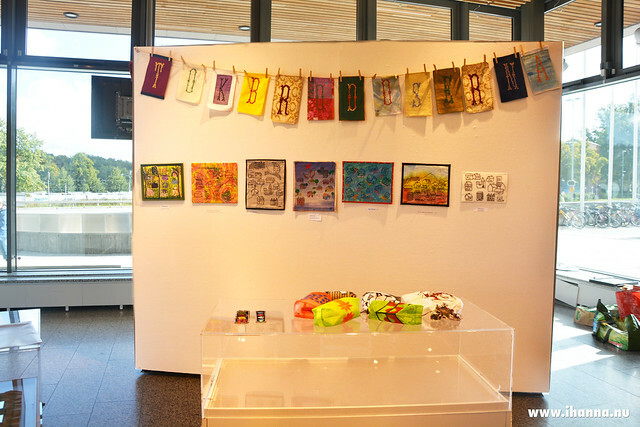 We have had a few embroidery exhibitions over the past couple of years, me and my lovely embroidery group. 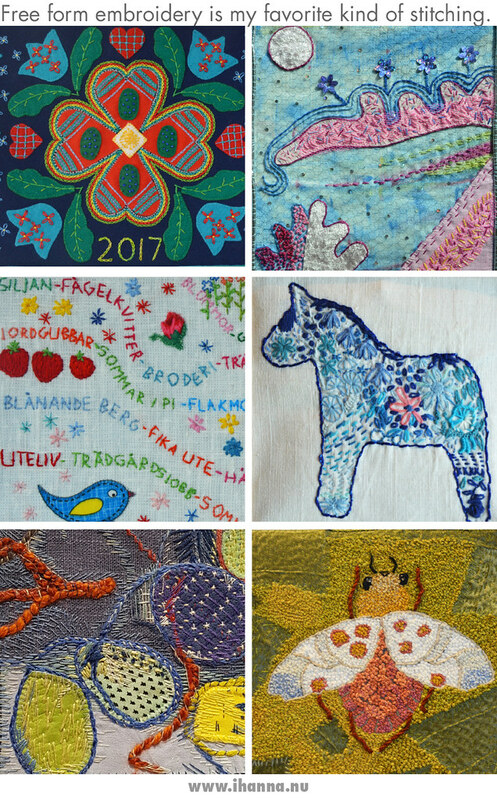 We’re called Tokbrodöserna – The Crazy Embroiderers. This year we had an exhibition for the second time at the lobby of the City Hall. It’s a great exhibition spot, open every weekday to the public. They’ve got large windows towards the road, and big white walls on wheels, that you can move around to make the space work for different exhibition needs. If you ever have been in an empty gallery, you know how cool it is when it’s transformed from a pristine white and totally empty place to a color explosion. A lovely gallery hall of artworks everywhere. I love being apart of that transformation, and being able to share my art with others. 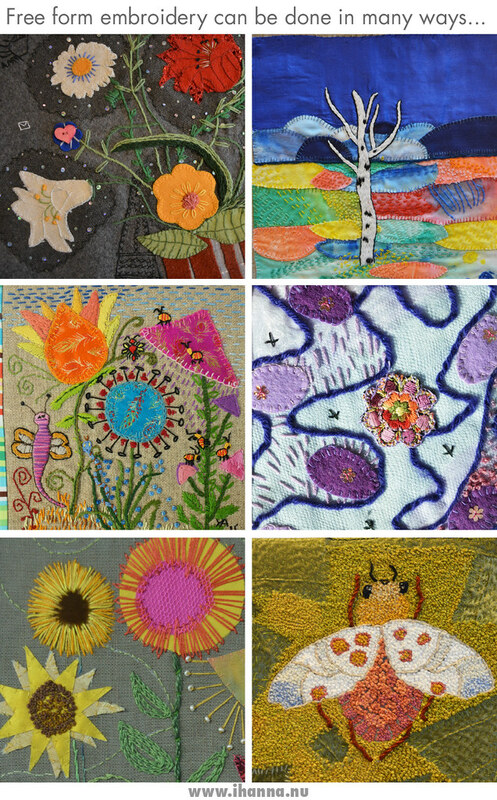 We all hang our embroideries together, most of them individual but some on themes we picked as a group, or collaboration pieces where we’ve worked together on as bigger projects. But sometimes when I see the finished result, I wish I had jumped on that specific embroidery project/train. 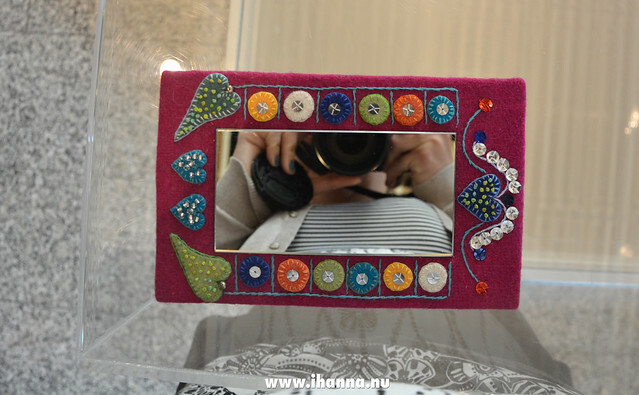 That was the case of the embroidered mirror frames. I photographed them before they were hang, from above. But of course I know my time is limited. I have to exercise restraint against inspiration sometimes! . They look so cool, and now I’m considering doing my own embroidered frame for a little mirror (I got one too, if I can find it). I love applique and embroidery on wool. Yum! 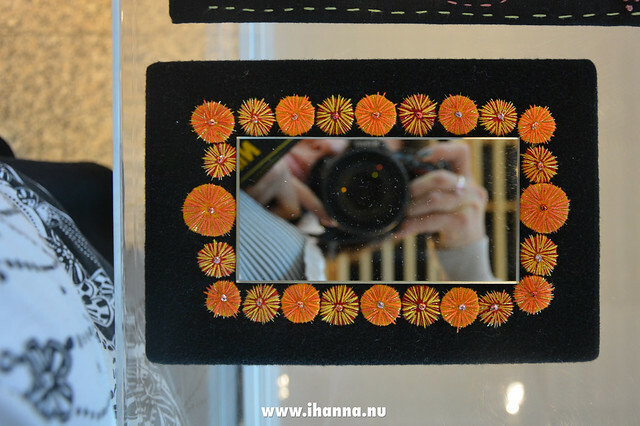 But until then, here are some details and close-ups I snapped at the embroidery exhibition of the other ladies works. I think they’re all amazing and so beautiful. I love how versitile free form embroidery is. Just like any other art, you can start how ever you want, and do what ever you like – only slower. My personal favorite pieces are still the Fly photo of an Inner Landscape in a series of three (I and II and III) that I made many years ago. I have been giving lots of techniques a try, trying to find “my style”, and I think I’m on my way to find it, so I’m going to share more of what I’ve stitched in upcoming weeks. I hope you’ll like that kind of blog posts too, from me, as well as some notebook stuff coming up of course. 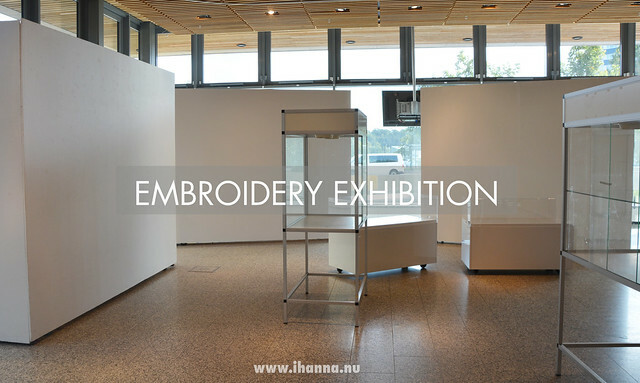 Have you ever been to an embroidery exhibition, or would you like to go, if you had the chance? Sign up for my Newsletter – to be notified when I launch an online mixed media embroidery workshop coming soon. Yay! Also, double check that you’re following me on Pinterest! I’ve got an Embroidery board and another one with lots of fabric called Textile Art. This entry was posted in Fabric Art and tagged embroidery, exhibitions, free form embroidery. Bookmark the permalink. Thank you for sharing your beautiful photography, Hanna! It looks like a very fun embroidery exhibition! I have not been to an embroidery exhibition before, but I really enjoyed admiring all the handicrafts submitted for judging at our county fair when I was growing up. There are so many creative people out there, I wish I could meet more in person. Thanks for the lovely post! Can’t wait to see some of your embroidery, too! Så härliga broderier! Jag skulle gärna göra en utflykt för att besöka en sån utställning. Pågår den fortfarande?